Roger Michell’s adaptation of the classic Daphne du Maurier novel My Cousin Rachel is the first film version since 1952, which featured a young Richard Burton and a not-quite-as-young Olivia de Havilland in the starring roles. The lengthy gap between both adaptations must surely be a record in an industry that’s overly eager to adapt just about any source material, even more than once, but here we are again with the Notting Hill director’s version of the novel, with him also receiving a sole writing credit for the first time in his career, and with Sam Claflin and Rachel Weisz in the Burton and de Havilland roles respectively. But while Michell’s My Cousin Rachel is a gorgeously-made costume drama with some charming performances and luscious cinematography, there are a few odd choices in this take that don’t wreck the film necessarily, but are certainly distracting enough to make them more of a problem than they should be. The plot, as in the novel, sees young Philip (Claflin) receive news that his beloved guardian has suddenly died, after receiving letters that blame his mysterious new wife Rachel (Weisz) for his growing and eventual demise. A vengeful Philip seeks the opportunity to carry out his revenge on her, but when she suddenly arrives at Philip’s estate he unexpectedly begins to fall in love with her after her charm and supposed naivety quickly wins him over. As Philip becomes more and more infatuated with his cousin-by-marriage, those around him begin to suspect that Rachel is indeed not as she appears, and may harbour an ulterior motive that involves Philip’s hefty estate and wealth. Let’s get the positives out of the way first: it’s a very well-made film, from the gothic costumes and sets to Mike Eley’s beautiful cinematography that captures the luscious landscapes of southern England sublimely. It’s also very well-acted, as Weisz and Claflin have very good chemistry with each other, which almost makes it a bit sad that she may be as deceitful as some believe her to be, because ulterior motive or not they would make a genuinely sweet couple together. Individually, they’re extremely watchable, and while Weisz is as capable an actress as she’s ever been Claflin has honestly never been better, finally coming into his own after a slew of YA romantic lead parts, and this should hopefully gain him stronger opportunities in the future to be even better. Strong supporting turns by Iain Glen as Philip’s godfather, Holliday Grainger as his childhood friend, and Simon Russell Beale as a family solicitor, are also worth looking out for. However, although one cannot fault the technical aspects of this film, a large chunk of the problems I have with this film lie in some of the odd choices that Michell has made with his vision. One such problem shouldn’t be as big an issue as it is for me, but I found it extremely distracting; the film opens with Claflin’s character Philip as a young boy with his beloved guardian Ambrose, who in an extremely odd twist is also played by Claflin, albeit with slightly longer hair and different clothes. At first, I thought it was Claflin’s Philip in a flashforward to later in life, but it’s established that the young boy is indeed Philip and for some reason Ambrose – who isn’t his father, or even his brother – is also being played by Claflin. In fact, when it does first show Philip as a grown man, we also see Ambrose again but it’s the same actor playing him as he is Philip in this scene. Later on, characters even mention that there’s a large similarity between Philip and Ambrose, like they know this bizarre casting choice was a mistake but can’t get funding to hire another actor (which they should have done in the first place) so just tried to literally write it off in the script. It’s a minor thing, sure, but this choice was just so weird to me that I honestly found it difficult to focus on anything else in this opening, other than the fact that Sam Claflin was playing both the main character and this other person who is a relative, sure, but not an immediate relative like his father or anything. If he was meant to be his father, that would have been a bit more understandable, but his cousin? Who, for all we know, might be once or twice removed in his family? That’s just really weird, guys. But again, this really is just a small part of the movie and though it may seem I found the movie to be ruined because of it, you’d be mistaken. Like I said, what follows is a well-made and well-acted costume drama, although I was never fully engrossed in this story or its characters, and I just found myself constantly being reminded of how much better a film Lady Macbeth was, a film which also has a cunning and manipulative female lead but also takes a few more risks with its narrative, making this feel relatively tame and safe by comparison. It’s not as satisfying either, since it ends on a rather sporadic anti-climax with quite a few loose ends left dangling by the time the credits roll, and certain characters make decisions that are pretty dumb and put them squarely in front of the bullseye, with no real resolution given to their follies. As it is, My Cousin Rachel is a fine film, with some lovely production values, but there were just a few things that prevented me from really liking it, like I’m sure a lot of other people will. Personally, I’d just rather watch Lady Macbeth again. 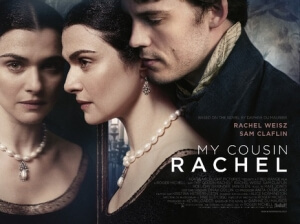 My Cousin Rachel is well-made and features some excellent performances by Rachel Weisz and Sam Claflin, but while it serves fine as an adaptation of Daphne du Maurier’s novel there were one or two grating personal issues I had with writer-director Roger Michell’s vision that prevented me from fully enjoying it.